I have never been a very good do it yourself kind of guy. Projects always turn out way more complicated than they first intended to be. My waders started leaking last weekend and I looked into repairing them. I found this video on youtube. It made it seem simple enough. The problem was the video shows the waders hanging from a platform which makes it easy to fill them and monitor the leaks. I don't have such a thing. Also it's hard to find a random place to hang waders and fill them up with water. I could have gambled and tried the rain gutter but if it broke I'd have two things to repair. So here was my bright idea. I'd get in the shower hold my waders up to the shower head and while they fill up I'll look for leaks. My first major mistake was understanding that waders are not very stiff. When they start to fill with water they expand like a water balloon. The weight picks up rapidly as the waders fill with water. The water got to about knee level when I realized there is no way I'm going to be able to hold these waders up while one leg fills up. My 3yr old daughter was watching the whole ordeal intently. How often does she get to watch her dad fill up some pants in the shower? The weight became unbearable and I asked my daughter to turn off the water. With the sound of the water she couldn't really understand what I was saying. I tried to kind of brace the waders on the shower head but then I was worried about the waders ripping the shower head off the wall. Eventually I just moved the waders down and tried to shut off the water. So here I am fighting with half filled waders, fumbling with the shower faucet and getting drenched at the same time. My daughter kept yelling at me, "what are you doing? what are you doing? Funny, I was kind of wondering the same thing. Luckily I was smart enough to strip down to my underwear and just a t-shirt before starting. Still I felt pretty dumb. I figured I might as well look the waders over. The shower had gotten the outside all wet and now it was hard to identify a leak from all the other water. I started trying to transfer water from one leg to the other and eventually I noticed some water leaking more in one spot. It was right on a seem on the upper thigh. Right where I thought there was a leak. I only had to drench myself, almost rip a shower head off and traumatize my child to find it. The end result was me buying another pair off Sierra Trading post. To me a leak at the seem is a sign of bad craftsmanship. I'm going to return the waders. It would be different if the hole was in another location and obviously from me hooking myself or briar bushes. I think I'm done with DIY fly fishing gear repairs for now. Every year the white bass run is different. The fish act different, the river re-shapes itself and the weather is never the same. This year we are having a heat wave. The temps today were in the 80's. A thunderstorm last night left the river stained and running with a decent flow. There were more trees and logs in the water than I remembered. I hit the trail just as the sun rays started peaking through the trees. The recent rain made the landscape look like it was wet with dew. As I came out of the forest I walked along a field that is maintained by the Army Corp Of Engineers. It was flash burned last year and in one year it has grown back even taller. I'm not sure if it is because of the strange weather or some other phenomenon but there were spider webs everywhere. There was so many they kind of blurred together and looked like they were a part of the plants. I'm always fascinated by spider webs and how no two seem to ever look that same. Some are very intricate and others are messy like they were made with no focus or specific goal in mind. The fishing was slow even with activity here and there. There were splashes and random plops from fish rising hitting things off the surface. I caught a bluegill on my first cast. It took several more before I finally felt the tug of what I waited a year for. I never remember how hard white bass fight. Even with a 5wt a 13inch fish can give you a nice tussle. The fish bend and shape themselves against the current making it difficult to bring them in. Once they get close they like to circle and make you spin in circles to keep up with them. I never get tired of catching them. It wasn't until this year that I realized how yellow the fishes eyes are. They are almost mustard yellow. I'm not sure if these fish see better in light or dark water but they can strike flies with lightning quickness. Once you hook one you never can quite tell how big it is. All you know is something is on the end of your line and it ain't happy. Some species fight like they're scared when you catch them, white bass act like they are pi$$ed off. For good reason too. The more time they are being yanked around the river is time they could be looking for mating prospects. This year was the first time I have ever seen spawning behavior. I saw boils from fish and several times I saw fish chasing each other. It was very cool. Every year the same places seem to be productive. I tried other parts of the river but at the end of the day I went back to the same hot spots I hit every year. These locations are becoming less and less secret. It seems that the internet and popularity of social media has really taken its toll on the white bass run. There were more people than I have ever seen this year and with the limit of 25 fish a day it's amazing anyone catches anything. Even with all the odds against the fish they seem to maintain good populations and the fish are larger this year than I remember. I'm not sure what I want more, bigger fish and less of them, or a ton of smaller size fish. I guess all I really care about is catching them. The morning ended with a few fish landed and time well spent with friends. A perfect fishing day if you ask me. "You're out here by yourself, if you get hurt who knows when someone will find you? This structure is about 15ft off the ground and if you fall in that water there's no telling what is in it. You could get impaled or land on something sharp. That small walk way looks old what if it just crumbled and broke apart?" "Would you really want this to be the way you die? Falling off a cement structure in the middle of nowhere. You could just drive to another location and walk in from the other side. Yeah it might be a mile walk but it's better than risking your life. This fence looks suspect your waders could get caught on it and cause you to fall...."
I just sat there staring at the fence I kept looking at the first one I climbed over then looked back at the second one. I felt stupid for just standing there at the top of this cement structure confused. That's when I felt this is a moment that's defining me. I'm no longer a risk taker. I'm a dad who's more into safey. Booo! How exciting is that? A part of me was actually ok with it and in the end the voice won and I worked my way back across the small walk way and climbed over the first fence. Walked back to my car and went around to the other side. In the end I followed my motto, live to fish another day. Last year I didn't try poppers that often because I thought they only worked in the summer. When the weather is warmer and the fish are on the move. Today I was hunting for bowfin and saw a bunch of bluegill. 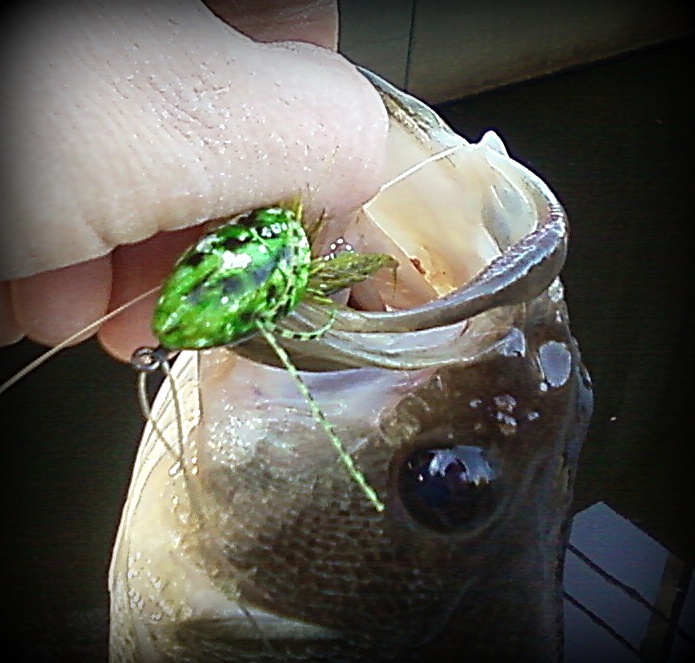 I didn't want to catch the little ones so I decided to fish one of the poppers I tied for smallmouth. After a few little piddly strikes I had a nice GULP! My fly disappeared and the rod bent over way to far to be a sunfish. This fish was fat and happy. It was the most unproportioned fish I think I have ever caught. It was almost as fat and tall as it was long. I've heard of people calling fish footballs before but this bass really did look like a football. The fish couldn't have been more than 13 inches but it looked like it swallowed two softballs. I tried various poppers but the bass seemed to really be keen on this particular one. I tied it based on a Sneaky Pete pattern. I wanted it to lay like a frog does when it just kind of hangs out on the surface. The bass today approved. They liked it so much I have to replace the rubber legs on the fly. Every time I fish I try to learn something new. This time I figured out I was setting the hook way too early. If I waited an extra second I'd hook the fish every time. I realized too that bass don't hit the same way all the time. It made me think how many times I've seen these similar strikes and thought they were bluegill. The bass did it all from flopping on the fly, creating a wake before striking, inhaling it, sipping it in and flushing it through their mouth like a toilet. Those have to be my favorite strikes. They always are unpredictable. I'm not even sure how the bass does it, they must come from straight underneath the fly. I never see any sign of the fish then WUSH!!!.... The fly is gone. I love it and my poppers will be on the end of my fly line more often this year. Today I sat down and tied some flies that I'm going to use for white bass fishing this year. The bulk of them is clousers. I've been trying to use material that I already have so I worked with some chartreuse material that could substitute for buck tail. Here is a up close pic of a small clouser I tied. I was messing around and tried tying a size 14 clouser. It was a lot more difficult than I first thought. It's been a while since I've tied some flies. It didn't take long for me to get back into the swing of things. Stabbing my fingers multiple times and getting glue on my hands. I think I've tied enough clousers for this year and I played around with some patterns that worked last year. I know these are ugly but they will work. Speaking of ugly flies I attempted tying one that worked for catfish last year and I think is a good carp fly. I have endearingly called it navel lint. 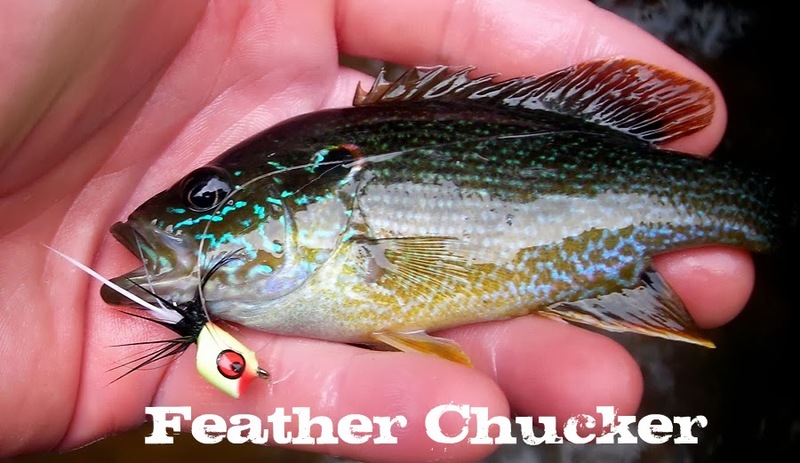 I love the coloring on the fly and the rubber legs hopefully give that extra attractiveness that makes fish strike. The fly is somewhat easy to tie but I need to figure out an easy way to tie the rubber legs in. They were a pain in the A$$! I tied them in first then while I was wrapping the dubbing which by the way was time consuming. I put the dubbing in a thread loop and twisted it until it made a yarn like consistency. Then I started wrapping the fly and tried to slowly go around the rubber legs. It took a lot of concentration to go around the legs and not get them wrapped up in the thread. So I had to find a balance of holding the legs with one hand and wrapping with the other. It wasn't fun. Watch these be the best flies that I've tied and I'll be up at night in tears tying 100 of these because they work. The blend of dubbing is a custom blend made by Stu Thompson. He's a popular carp fisherman in Canada. He can usually be found hanging out at in the forums at warmfly.com. I was able to get out and fish. I tried a local pond that is usually good no matter when you fish it. A cold front was coming in and a constant cool breeze kept me from getting comfortable. The fish weren't in their usual spots. I walked around the pond and as I got near the back end I realized the wind was pushing the water in that direction. I figured maybe bass were waiting in a back eddy for food to be blown in the current too them. As luck would have it I was right and got a nice tug. It always amazing me how differently colored largemouth bass can be. This one has basically no lateral line to speak of. It was so silver it almost looked white. I caught it on a black wooly bugger. 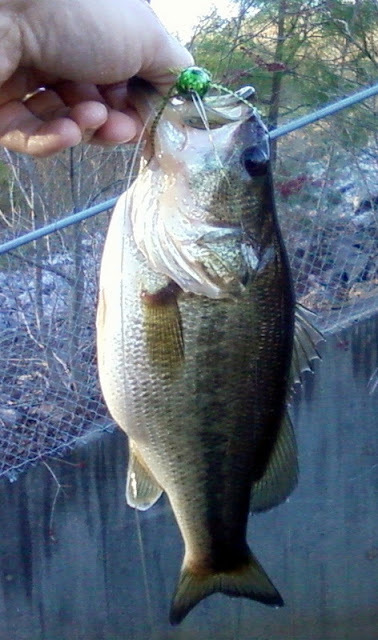 I forgot how bass hit in cold weather. It feels like your fly bumped a rock or stick on the retrieve. If you give any slack the fish is gone. If you keep stripping like you want to snag your fly you'll hook them. I can never seem to remember to set the hook a few times too. When I got this fish on shore he flopped a few times and the fly came right out. I hooked a few more fish in the back eddy and the wind chased me off the pond. I really didn't expect to catch much. I would have expected to catch bluegill if I caught anything. 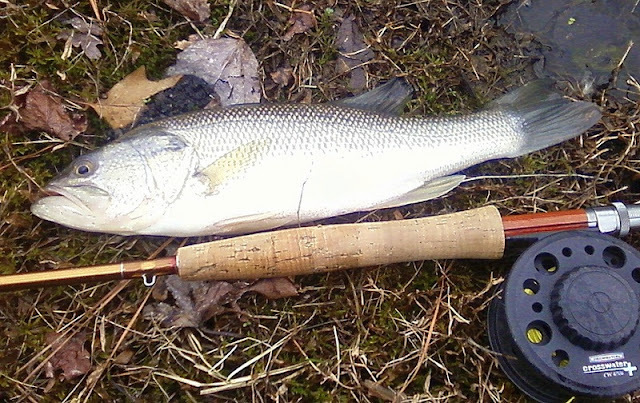 It's strange to be catching bass before sunfish. I think this year is going to be different than any other year I've fished.